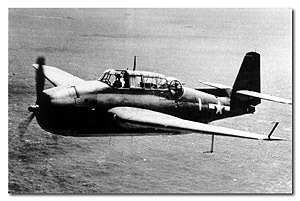 The Swamp Avenger lies in a mangrove swamp, east of Bloody Nose Ridge on Peleliu. Tangie Hesus, a Palauan living on Peleliu, is the local expert on the Peleliu battle areas. Tangie persuaded two mangrove fishermen to take us to the wreck site of an unknown plane lying in the swamps. We traveled by small boat from the northern dock on Peleliu, south along the eastern coast and entered into a mangrove swamp area that was quite large. 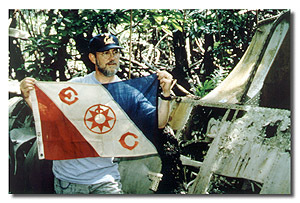 We traveled about 40 minutes and, with the eastern face of Bloody Nose Ridge (the site of one of the most devastating portions of the battle) to our right, we suddenly turned into the swamp where we could see a relatively intact aircraft, about 50 feet into the mangroves lying in a northerly direction with landing gear up. As we approached, it became immediately apparent it was a TBF Avenger, a three man torpedo bomber from World War II (Picture 25). There appeared to be shrapnel hits all over the plane; the canopy was missing. The propeller, though bent, was present, along with all other major components of the plane, although the port wing was sheared off and behind the plane. The cockpit was missing all its instruments and there was no evidence of human remains. The "star and bar" emblem on the starboard fuselage was still present. No machine guns were seen. The vertical stabilizer did have a Bureau Number on it. This aircraft has not yet been identified but an ongoing effort is in progress.